I read that one feature of TB for Mac was to search for contacts in Addressbook then be able to add them as thoughts. This would be a great feature as other URL-based contact details and personal notes on contacts could all be added. What version of TheBrain and OS are you using? Any additional information you can share will help us troubleshoot this issue. Thank you. I had this problem with Yosemite but it was solved with the latest release. Patrick's question is quite pertinent! Let me know if I'm out of date! 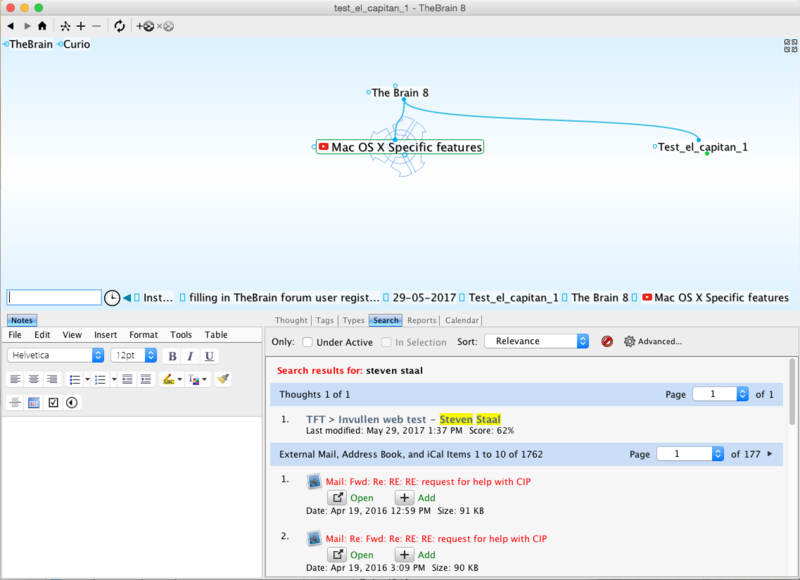 Still stuck on this issue; very frustrating as I want to use TheBrain for contacts related to topics I'm keeping in TheBrain. Any ideas on my inability to search/ find Contacts in TheBrain that I can find in Spotlight? I'm not really sure what else to recommend as I cannot reproduce this issue on my end with all the latest software updates. Perhaps we can setup a web meeting to troubleshoot this in person. If you would like to do this, please let me know what time works for you so we can schedule something and send you the required information to join via email. Patrick, I'm changing computers in the next week; I'll see if I have the same problem with the new mac. I'll let you know, thanks for the note. Has this issue been resolved in the mean time? I realise this thread is near to 3 years old, but I'm experiencing the exact same issues? Doing a search in ver. 8 shows mails with the name of the person I want to add, but no contacts whatsoever. Doing the same search yesterday revealed 177 results (all mail) and today only 1?? Also the popup asking permission to access calendar and reminders keeps popping up each time? It's still currently a known issue. Very disappointing I must say. Certainly because this seems not a high priority as an issue from 2014 is still not being resolved in 2017. Obviously it has been possible at a given time with a given OS version and a given TheBrain version since it's in the video. Can you provide me with the versions used in the video? Please make it a sticky and also provide the information for windows. This may be handy as I frequently use virtual machines and may come up with an acceptable workflow. Also may I recommend to add this information to the website? In the mean time I've downloaded and tested TheBrain for mac version 7. I used a 10.6 virtual machine for testing that environment. I don't see any console message using Yosemite. For me, and I think for many users (looking at the search results on the forum) interaction with contacts, reminders, ical is extremely important. Therefore it is a pity to see this is lacking for so long. Making it a sticky will at least allow for other users to add their experience. I'm really very keen on finding out what did work. Using Outlook? Or? Therefore starting off where it DID work is important. Unfortunately, we are in a long stage of development and there are some bugs that have been introduced due to recent OS X updates and during this time, our engineers have been hard at work on a new version, which is currently on limited beta release: http://www.thebrain.com/thebrain9. Due to the heavy focus on this new version, however, we have had to forego working on issues in our current version. We apologize for any inconvenience caused by this. It works in previous versions of macOS, prior to Yosemite. We are definitely aware this is a wanted issue and we will work on fixes as soon as possible. In the meantime, you should be able to drag and drop items to your desktop first to create an attachment that can then be added to a Brain via drag and drop.